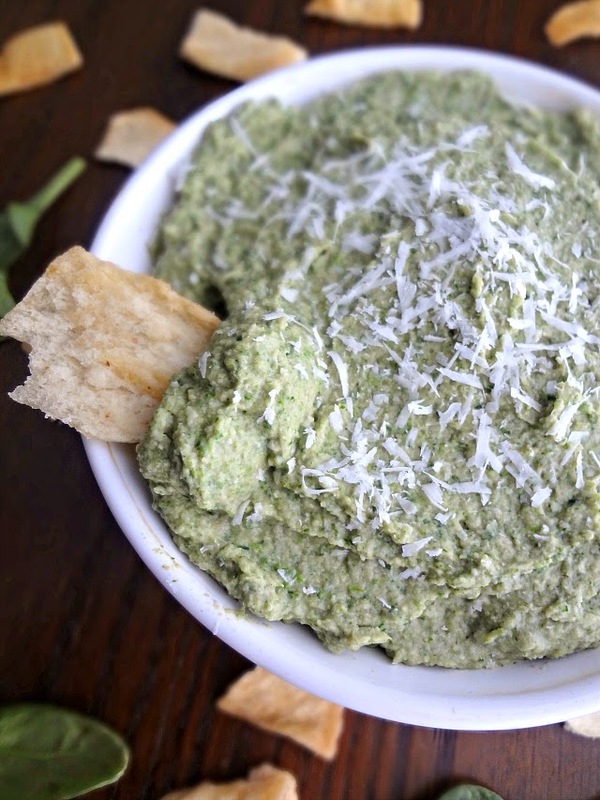 I love spinach artichoke dip, I love hummus. So...really...it just makes sense to combine the two! They're both delicious dips. They're both crowd pleasers. They both took some time for me to warm up to. Yepp. 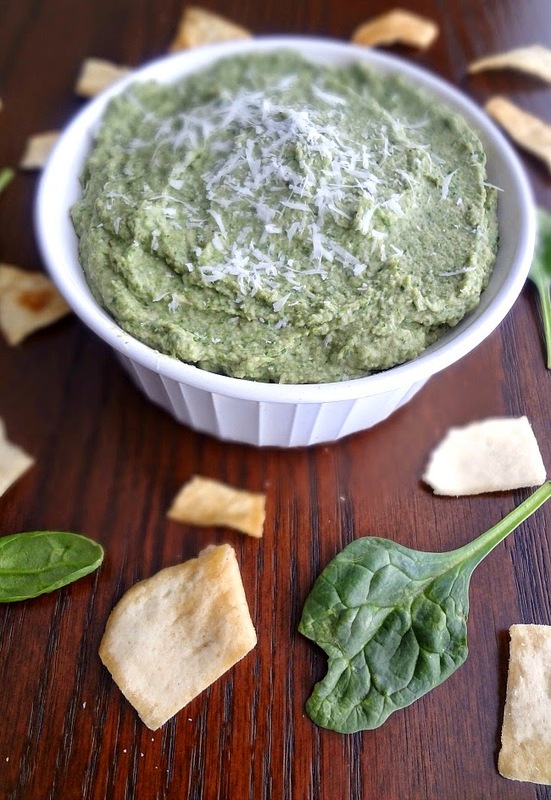 When I first tried spinach and artichoke dip I was not sold. However, my best friend insisted we share it every time we went to Friday's together so I eventually grew to love it. And hummus I wasn't sold on, until I had my 10th bite. Then I couldn't get enough. Which is exactly what happened with this hybrid. At first I was all, "Ohhh...hmmm...I dunno." And now I can't stop shoveling it into my face. Same thing with Michael. He was like "Eh, it's ok." 20 minutes later he yelled, "TAKE THIS AWAY FROM ME I CANNOT STOP EATING IT!" Thank goodness we got to the point of being unable to stop eating it becaaause...I totally should have waited to make this until there was a party, because it definitely makes a large party-sized amount. I was a little overwhelmed when I realized how much hummus I had just made. So--be prepared for that. If you're not planning on bringing it someplace, halve the recipe. You'll still have plenty. Not that any that I made went to waste. Oh nooo-I ate it right up. Yes yes yes! And the taste? Honestly...it's exactly what you'd expect. 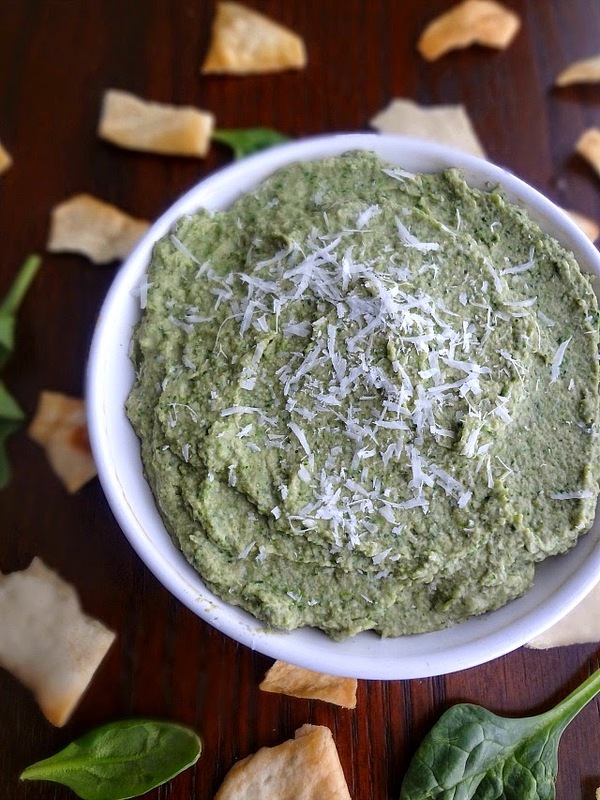 It's like hummus merged with spinach and artichoke dip. So, yeah. That's the story of how Kayle got some veggies into her system thanks to hummus! Makes a lot! Recipe can be halved for smaller parties or just yourself. In a medium-large skillet, heat olive oil, garlic, and spinach over medium heat until the spinach wilts, about 3 minutes. Add artichokes and saute until they're completely heated through-about a minute or so. Remove from heat. In a large food processor (my food processor was almost too small for this), process the garbanzo beans, tahini, and lemon juice until fairly smooth. Add the garlic, spinach, artichokes and salt and Parmesan cheese. Process until combined and smooth, As needed add reserved chickpea liquid or olive oil until it reaches your desired consistency. Serve with pita chips, vegetables, etc. For the record...it didn't look so neon green in real life. I don't know what went wrong with these pictures. Regardless-just remember. It's delicious. Especially when you're on your 20th scoop.